This article is about the extant varieties of Arabic. For the historical language family, see Classification of Arabic languages. There are many varieties of Arabic (also called dialects of Arabic or vernacular languages) in existence. Arabic is a Semitic language within the Afroasiatic family that originated on the Arabian Peninsula. It is classified as a macrolanguage comprising 30 modern varieties, including its standard form. The largest divisions occur between the spoken languages of different regions. Some varieties of Arabic in North Africa, for example, are not easily comprehensible to an Arabic speaker from the Levant or the Persian Gulf. Within these broad regions further and considerable geographic distinctions exist, within countries, across country borders, even between cities and villages. Another major distinction exists between the widely diverging colloquial spoken varieties, used for nearly all everyday speaking situations, and the formal standardized language, found mostly in writing or in prepared speech. The regionally prevalent variety is learned as the speaker's first language while the formal language is subsequently learned in school. The formal language itself varies between its modern iteration, Modern Standard Arabic (often called MSA in English) and the Classical Arabic that serves as its basis, though Arabic speakers typically do not make this distinction. The largest differences between the classical/standard and the colloquial Arabic are the loss of grammatical case; a different and strict word order; the loss of the previous system of grammatical mood, along with the evolution of a new system; the loss of the inflected passive voice, except in a few relic varieties; restriction in the use of the dual number and (for most varieties) the loss of the feminine plural. Many Arabic dialects, Maghrebi Arabic in particular, also have significant vowel shifts and unusual consonant clusters. Unlike other dialect groups, in the Maghrebi Arabic group, first person singular verbs begin with a n- (ن). Further substantial differences exist between Bedouin and sedentary speech, the countryside and major cities, ethnic groups, religious groups, social classes, men and women, and the young and the old. These differences are to some degree bridgeable. Often, Arabic speakers can adjust their speech in a variety of ways according to the context and to their intentions—for example, to speak with people from different regions, to demonstrate their level of education or to draw on the authority of the spoken language. Arabic is characterized by a wide number of varieties; however, Arabic speakers are often able to manipulate the way they speak based on the circumstances. There can be a number of motivations for changing one's speech: the formality of a situation, the need to communicate with people with different dialects, to get social approval, to differentiate oneself from the listener, when citing a written text, to differentiate between personal and professional or general matters, to clarify a point, and to shift to a new topic. An important factor in the mixing or changing of Arabic is the concept of a prestige dialect. This refers to the level of respect accorded to a language or dialect within a speech community. The formal Arabic language carries a considerable prestige in most Arabic-speaking communities, depending on the context. This is not the only source of prestige, though. Many studies have shown that for most speakers, there is a prestige variety of vernacular Arabic. In Egypt, for non-Cairenes, the prestige dialect is Cairo Arabic. For Jordanian women from Bedouin or rural background, it may be the urban dialects of the big cities, especially including the capital Amman. Moreover, in certain contexts, a dialect relatively different from formal Arabic may carry more prestige than a dialect closer to the formal language—this is the case in Bahrain, for example. Language mixes and changes in different ways. Arabic speakers often use more than one variety of Arabic within a conversation or even a sentence. This process is referred to as code-switching. For example, a woman on a TV program could appeal to the authority of the formal language by using elements of it in her speech in order to prevent other speakers from cutting her off. Another process at work is "leveling", the "elimination of very localised dialectical features in favour of more regionally general ones." This can affect all linguistic levels—semantic, syntactic, phonological, etc. The change can be temporary, as when a group of speakers with substantially different Arabics communicate, or it can be permanent, as often happens when people from the countryside move to the city and adopt the more prestigious urban dialect, possibly over a couple of generations. In this case, /fiː/ is most likely to be used as it is not associated with a particular region and is the closest to a dialectical middle ground for this group of speakers. Moreover, given the prevalence of movies and TV shows in Egyptian Arabic, the speakers are all likely to be familiar with it. Iraqi aku, Levantine fīh and North African kayn all evolve from Classical Arabic forms (yakūn, fīhi, kā'in respectively), but now sound very different. Sometimes a certain dialect may be associated with backwardness and does not carry mainstream prestige—yet it will continue to be used as it carries a kind of covert prestige and serves to differentiate one group from another when necessary. These large regional groups do not correspond to borders of modern states. In the western parts of the Arab world, varieties are referred to as الدارجة ad-dārija, and in the eastern parts, as العامية al-ʿāmmiyya. Nearby varieties of Arabic are mostly mutually intelligible, but faraway varieties tend not to be. Varieties west of Egypt are particularly disparate, with Egyptian Arabic speakers claiming difficulty in understanding North African Arabic speakers, while North African Arabic speakers' ability to understand other Arabic speakers is mostly due to the widespread popularity of Egyptian Standard and to a lesser extent, the Lebanese popular media (this phenomenon is called asymmetric intelligibility). One factor in the differentiation of the varieties is the influence from other languages previously spoken or still presently spoken in the regions, such as Coptic in Egypt, French, Ottoman Turkish, Italian, Spanish, Berber, Punic or Phoenician in North Africa, Himyaritic, Modern South Arabian and Old South Arabian in Yemen and Aramaic in the Levant. Speakers of mutually unintelligible varieties are often able to communicate by switching to Modern Standard Arabic. Modern languages have also typically provided a significant number of new words, and have sometimes also influenced pronunciation or word order. Examples are Turkish and English in Egypt, French in North Africa and Syria, English and French in Lebanon, and English and Hebrew in Israel. However, a much more significant[weasel words] factor for all five dialect groups is, as Latin among Romance languages, retention (or change of meaning) of the form of Classical Arabic used in the Quran. The following example illustrates similarities and differences between the literary, standardized varieties, and major urban dialects of Arabic. Maltese, a distantly related Siculo-Arabic language descended from Maghrebi Arabic is also provided. True pronunciations differ; transliterations used approach an approximate demonstration. Also, the pronunciation of Modern Standard Arabic differs significantly from region to region. I love reading a lot. I only found this old book. I wanted to read a book about the history of women in France. jien inħobb naqra ħafna meta mort il-librerija Sibt biss hu dan il-ktieb il-qadim Ridt naqra ktieb dwar l-istorja tan-nisa fi Franza. German: Ich lese sehr gerne. Als ich zur Bibliothek ging, fand ich nur dieses alte Buch, obwohl ich ein Buch über die Geschichte der Frauen in Frankreich lesen wollte. Dutch: Ik lees zeer graag. Toen ik naar de bibliotheek ging, vond ik slechts dit oude boek, hoewel ik een boek over de geschiedenis van de vrouwen in Frankrijk had willen lezen. Spanish (orthography): Me gusta mucho leer. Cuando fui a la biblioteca, encontré solamente este viejo libro. Quería leer un libro sobre la historia de las mujeres en Francia. Portuguese (orthography): Gosto muito de ler. Quando fui à biblioteca, encontrei somente este velho livro. Queria ler um livro sobre a história das mulheres na França. Some linguists do argue that the varieties of Arabic are different enough to qualify as separate languages in the way that Spanish and Portuguese or German and Dutch do. However, as Reem Bassiouney points out, perhaps the difference between 'language' and 'dialect' is to some degree political rather than linguistic. "Peripheral" varieties of Arabic – that is, varieties spoken in countries where Arabic is not a dominant language and a lingua franca (e.g., Turkey, Iran, Cyprus, Chad, and Nigeria) – are particularly divergent in some respects, especially in their vocabularies, since they are less influenced by classical Arabic. However, historically they fall within the same dialect classifications as the varieties that are spoken in countries where Arabic is the dominant language. Because most of these peripheral dialects are located in Muslim majority countries, they are now influenced by Classical Arabic and Modern Standard Arabic, the Arabic varieties of the Qur'an and their Arabic-speaking neighbours, respectively. Probably the most divergent non-creole Arabic variety is Cypriot Maronite Arabic, a nearly extinct variety that has been heavily influenced by Greek, and written in Greek and Latin alphabets. Maltese is descended from Siculo-Arabic. Its vocabulary has acquired a large number of loanwords from Sicilian, Italian and recently English, and it uses only a Latin-based alphabet. It is the only Semitic language among the official languages of the European Union. Arabic-based pidgins (which have a limited vocabulary consisting mostly of Arabic words, but lack most Arabic morphological features) are in widespread use along the southern edge of the Sahara, and have been for a long time. In the eleventh century, the medieval geographer al-Bakri records a text in an Arabic-based pidgin, probably one that was spoken in the region corresponding to modern Mauritania. In some regions, particularly around the southern Sudan, the pidgins have creolized (see the list below). Even within countries where the official language is Arabic, different varieties of Arabic are spoken. For example, within Syria, the Arabic spoken in Homs is recognized as different from the Arabic spoken in Damascus, but both are considered to be varieties of "Levantine" Arabic. And within Morocco, the Arabic of the city of Fes is considered different from the Arabic spoken elsewhere in the country. Another way that varieties of Arabic differ is that some are formal and others are colloquial (that is, vernacular). There are two formal varieties, or اللغة الفصحى al-lugha(t) al-fuṣḥá, One of these, known in English as Modern Standard Arabic (MSA), is used in contexts such as writing, broadcasting, interviewing, and speechmaking. The other, Classical Arabic, is the language of the Qur'an. It is rarely used except in reciting the Qur'an or quoting older classical texts. (Arabic speakers typically do not make an explicit distinction between MSA and Classical Arabic.) Modern Standard Arabic was deliberately developed in the early part of the 19th century as a modernized version of Classical Arabic. People often use a mixture of both colloquial and formal Arabic. For example, interviewers or speechmakers generally use MSA in asking prepared questions or making prepared remarks, then switch to a colloquial variety to add a spontaneous comment or respond to a question. The ratio of MSA to colloquial varieties depends on the speaker, the topic, and the situation—amongst other factors. Today even the least educated citizens are exposed to MSA through public education and exposure to mass media, and so tend to use elements of it in speaking to others. This is an example of what linguistics researchers call diglossia. See Linguistic register. فصحى التراث fuṣḥá at-turāṯ, 'heritage classical': The Classical Arabic of Arab literary heritage and the Qur'an. This is primarily a written language, but it is heard in spoken form at the mosque or in religious programmes on television, but with a modernized pronunciation. فصحى العصر fuṣḥá al-ʿaṣr, 'contemporary classical' or 'modernized classical': This is what Western linguists call Modern Standard Arabic (MSA). It is a modification and simplification of Classical Arabic that was deliberately created for the modern age. Consequently, it includes many newly coined words, either adapted from Classical Arabic (much as European scholars during the Renaissance coined new English words by adapting words from Latin), or borrowed from foreign, chiefly European, languages. Although it is principally a written language, it is spoken when people read aloud from prepared texts. Highly skilled speakers can also produce it spontaneously, though this typically occurs only in the context of media broadcasts – particularly in talk and debate programs on pan-Arab television networks such as Al Jazeera and Al Arabiya – where the speakers want to be simultaneously understood by Arabic speakers in all the various countries where these networks' target audiences live. If highly skilled speakers use it spontaneously, it is spoken when Arabic speakers of different dialects communicate each other. Commonly used as a written language, it is found in most books, newspapers, magazines, official documents, and reading primers for small children; it is also used as another version of literary form of the Qur'an and in modernized revisions of writings from Arab literary heritage. عامية المثقفين ʿāmmiyyat al-muṯaqqafīn, 'colloquial of the cultured': This is a vernacular dialect that has been heavily influenced by MSA, i.e. borrowed words from MSA (this is similar to the literary Romance languages, wherein scores of words were borrowed directly from Classical Latin); loanwords from MSA replace or are sometimes used alongside native words evolved from Classical Arabic in colloquial dialects. It tends to be used in serious discussions by well-educated people, but is generally not used in writing except informally. It includes a large number of foreign loanwords, chiefly relating to the technical and theoretical subjects it is used to discuss, sometimes used in non-intellectual topics. Because it can generally be understood by listeners who speak varieties of Arabic different from those of the speaker's country of origin, it is often used on television, and it is also becoming the language of instruction at universities. عامية المتنورين ʿāmmiyyat al-mutanawwarīn 'colloquial of the basically educated': This is the everyday language that people use in informal contexts, and that is heard on television when non-intellectual topics are being discussed. It is characterized, according to Badawi, by high levels of borrowing. Educated speakers usually code-switch between ʿāmmiyyat al-muṯaqqafīn and ʿāmmiyyat al-mutanawwarīn. عامية الأميين ʿāmmiyyat al-ʾummiyyīn, 'colloquial of the illiterates': This is very colloquial speech characterized by the absence of any influence from MSA and by relatively little foreign borrowing. These varieties are the almost entirely naturally evolved direct descendants of Classical Arabic. Almost everyone in Egypt is able to use more than one of these levels of speech, and people often switch between them, sometimes within the same sentence. This is generally true in other Arabic-speaking countries as well. The spoken dialects of Arabic have occasionally been written, usually in the Arabic alphabet. Vernacular Arabic was first recognized as a written language distinct from Classical Arabic in 17th century Ottoman Egypt, when the Cairo elite began to trend towards colloquial writing. A record of the Cairo vernacular of the time is found in the dictionary compiled by Yusuf al-Maghribi. More recently, many plays and poems, as well as a few other works (even translations of Plato)[verification needed] exist in Lebanese Arabic and Egyptian Arabic; books of poetry, at least, exist for most varieties. In Algeria, colloquial Maghrebi Arabic was taught as a separate subject under French colonization, and some textbooks exist. Mizrahi Jews throughout the Arab world who spoke Judeo-Arabic dialects rendered newspapers, letters, accounts, stories, and translations of some parts of their liturgy in the Hebrew alphabet, adding diacritics and other conventions for letters that exist in Judeo-Arabic but not Hebrew. The Latin alphabet was advocated for Lebanese Arabic by Said Aql, whose supporters published several books in his transcription. In 1944, Abdelaziz Pasha Fahmi, a member of the Academy of the Arabic Language in Egypt proposed the replacement of the Arabic alphabet with the Latin alphabet. His proposal was discussed in two sessions in the communion but was rejected, and faced strong opposition in cultural circles. The Latin alphabet is used by Arabic speakers over the Internet or for sending messages via cellular phones when the Arabic alphabet is unavailable or difficult to use for technical reasons; this is also used in Modern Standard Arabic when Arabic speakers of different dialects communicate each other. Sociolinguistics is the study of how language usage is affected by societal factors, e.g., cultural norms and contexts (see also pragmatics). The following sections examine some of the ways that modern Arab societies influence how Arabic is spoken. The religion of Arabic speakers is sometimes involved in shaping how they speak Arabic. Of course, as is the case with other variables, religion cannot be seen in isolation. It is generally connected with the political systems in the different countries. Unlike that which is often the case in the West, religion in the Arab world is not usually seen as an individual choice. Rather, it is matter of group affiliation: one is born a Muslim (and even either Sunni or Shiite among them), Christian or Jew, and this becomes a bit like one's ethnicity. Religion as a sociolinguistic variable should be understood in this context. Bahrain provides an excellent illustration. A major distinction can be made between the Shiite Bahraini, who are the oldest population of Bahrain, and the Sunni population that began to immigrate to Bahrain in the eighteenth century. The Sunni form a minority of the population. The ruling family of Bahrain is Sunni. The colloquial language represented on TV is almost invariably that of the Sunni population. Therefore, power, prestige and financial control are associated with the Sunni Arabs. This is having a major effect on the direction of language change in Bahrain. The case of Iraq also illustrates how there can be significant differences in how Arabic is spoken on the basis of religion. (Note that the study referred to here was conducted before the Iraq War.) In Baghdad, there are significant linguistic differences between Arabic Christian and Muslim inhabitants of the city. The Christians of Baghdad are a well-established community, and their dialect has evolved from the sedentary vernacular of urban medieval Iraq. The typical Muslim dialect of Baghdad is a more recent arrival in the city and comes from Bedouin speech instead. In Baghdad, as elsewhere in the Arab world, the various communities share MSA as a prestige dialect, but the Muslim colloquial dialect is associated with power and money, given that that community is the more dominant. Therefore, the Christian population of the city learns to use the Muslim dialect in more formal situations, for example, when a Christian school teacher is trying to call students in the class to order. A basic distinction that cuts across the entire geography of the Arabic-speaking world is between sedentary and nomadic varieties (often misleadingly called Bedouin). The distinction stems from the settlement patterns in the wake of the Arab conquests. As regions were conquered, army camps were set up that eventually grew into cities, and settlement of the rural areas by nomadic Arabs gradually followed thereafter. In some areas, sedentary dialects are divided further into urban and rural variants. The most obvious phonetic difference between the two groups is the pronunciation of the letter ق qaf, which is pronounced as a voiced /ɡ/ in the Urban varieties of the Arabian Peninsula (like the Hejazi dialect in the ancient urban cities of Mecca and Medina) as well as in the Bedouin dialects across all Arabic-Speaking Countries, but is voiceless mainly in the post-Arabized Urban centers as either /q/ (with [ɡ] being an allophone in few words mostly in North African cities) or /ʔ/ (merging ⟨ق⟩ with ⟨ء⟩) in the urban centers of Egypt and the Levant, all of which were mostly Arabized after the Islamic Conquests. The other major phonetic difference is that the rural varieties preserve the Classical Arabic (CA) interdentals /θ/ ث and /ð/ ذ, and merge the CA emphatic sounds /ɮˤ/ ض and /ðˤ/ ظ into /ðˤ/ rather than sedentary /dˤ/. The most significant differences between rural Arabic and non-rural Arabic are in syntax. The sedentary varieties in particular share a number of common innovations from CA. [specify] This has led to the suggestion, first articulated by Charles Ferguson, that a simplified koiné language developed in the army staging camps in Iraq, from whence the remaining parts of the modern Arab world were conquered. In general the rural varieties are more conservative than the sedentary varieties and the rural varieties within the Arabian peninsula are even more conservative than those elsewhere. Within the sedentary varieties, the western varieties (particularly, Moroccan Arabic) are less conservative than the eastern varieties. A number of cities in the Arabic world speak a "Bedouin" variety, which acquires prestige in that context. ^ In Egypt, when there is a need to transcribe /ʒ/ or /d͡ʒ/, both are approximated to [ʒ] using چ. ^ a b /g/ is not part of the phonemic inventory of urban Levantine dialects, including Palestinian. ^ /t͡ʃ/ is a native phoneme/allophone only in Iraqi, Gulf and some rural Levantine dialects. ^ unlike /g/ and /t͡ʃ/, /p/ and /v/ never appear natively in Arabic dialects, and they are always restricted to loanwords, with their usage depending on the speaker. The order subject–verb–object may be more common than verb–subject–object. Verbal agreement between subject and object is always complete. In CA, there was no number agreement between subject and verb when the subject was third-person and the subject followed the verb. Loss of case distinctions (ʾIʿrab). Loss of original mood distinctions other than the indicative and imperative (i.e., subjunctive, jussive, energetic I, energetic II). The dialects differ in how exactly the new indicative was developed from the old forms. The sedentary dialects adopted the old subjunctive forms (feminine /iː/, masculine plural /uː/), while many of the Bedouin dialects adopted the old indicative forms (feminine /iːna/, masculine plural /uːna/). The sedentary dialects subsequently developed new mood distinctions; see below. Loss of dual marking everywhere except on nouns. A frozen dual persists as the regular plural marking of a small number of words that normally come in pairs (e.g., eyes, hands, parents). In addition, a productive dual marking on nouns exists in most dialects (Tunisian and Moroccan Arabic are exceptions). This dual marking differs syntactically from the frozen dual in that it cannot take possessive suffixes. In addition, it differs morphologically from the frozen dual in various dialects, such as Levantine Arabic. The productive dual differs from CA in that its use is optional, whereas the use of the CA dual was mandatory even in cases of implicitly dual reference. The CA dual was marked not only on nouns, but also on verbs, adjectives, pronouns and demonstratives. Development of an analytic genitive construction to rival the constructed genitive. Compare the similar development of shel in Modern Hebrew. The Bedouin dialects make the least use of the analytic genitive. Moroccan Arabic makes the most use of it, to the extent that the constructed genitive is no longer productive, and used only in certain relatively frozen constructions. The relative pronoun is no longer inflected. In CA, it took gender, number and case endings. Pronominal clitics ending in a short vowel moved the vowel before the consonant. Hence, second singular /-ak/ and /-ik/ rather than /-ka/ and /-ki/; third singular masculine /-uh/ rather than /-hu/. Similarly, the feminine plural verbal marker /-na/ became /-an/. Because of the absolute prohibition in all Arabic dialects against having two vowels in hiatus, the above changes occurred only when a consonant preceded the ending. 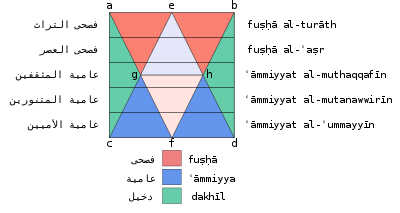 When a vowel preceded, the forms either remained as-is or lost the final vowel, becoming /-k/, /-ki/, /-h/ and /-n/, respectively. Combined with other phonetic changes, this resulted in multiple forms for each clitic (up to three), depending on the phonetic environment. The verbal markers /-tu/ (first singular) and /-ta/ (second singular masculine) both became /-t/, while second singular feminine /-ti/ remained. Mesopotamian dialects in southeastern Turkey are an exception for they retain the ending /-tu/ for first person singular. In the dialect of southern Nejd (including Riyadh), the second singular masculine /-ta/ has been retained, but takes the form of a long vowel rather than a short one as in CA. The forms given here were the original forms, and have often suffered various changes in the modern dialects. All of these changes were triggered by the loss of final short vowels (see below). Various simplifications have occurred in the range of variation in verbal paradigms. Third-weak verbs with radical /w/ and radical /j/ (traditionally transliterated y) have merged in the form I perfect tense. They had already merged in CA, except in form I. Form I perfect faʕula verbs have disappeared, often merging with faʕila. Doubled verbs now have the same endings as third-weak verbs. Some endings of third-weak verbs have been replaced by those of the strong verbs (or vice versa, in some dialects). Loss of the inflected passive (i.e., marked through internal vowel change) in finite verb forms. New passives have often been developed by co-opting the original reflexive formations in CA, particularly verb forms V, VI and VII (In CA these were derivational, not inflectional, as neither their existence nor exact meaning could be depended upon; however, they have often been incorporated into the inflectional system, especially in more innovative sedentary dialects). Hassaniya Arabic contains a newly developed inflected passive that looks somewhat like the old CA passive. Najdi Arabic has retained the inflected passive up to the modern era, though this feature is on its way to extinction as a result of the influence of other dialects. Loss of the indefinite /n/ suffix (tanwiin) on nouns. When this marker still appears, it is variously /an/, /in/, or /en/. In some Bedouin dialects it still marks indefiniteness on any noun, although this is optional and often used only in oral poetry. In other dialects it marks indefiniteness on post-modified nouns (by adjectives or relative clauses). All Arabic dialects preserve a form of the CA adverbial accusative /an/ suffix, which was originally a tanwiin marker. Loss of verb form IV, the causative. Verb form II sometimes gives causatives, but is not productive. Uniform use of /i/ in imperfect verbal prefixes. CA had /u/ before form II, III and IV active, and before all passives, and /a/ elsewhere. Some Bedouin dialects in the Arabian peninsula have uniform /a/. Najdi Arabic has /a/ when the following vowel is /i/, and /i/ when the following vowel is /a/. Loss of a separately distinguished feminine plural in verbs, pronouns and demonstratives. This is usually lost in adjectives as well. Development of a new indicative-subjunctive distinction. The indicative is marked by a prefix, while the subjunctive lacks this. The prefix is /b/ or /bi/ in Egyptian Arabic and Levantine Arabic, but /ka/ or /ta/ in Moroccan Arabic. It is not infrequent to encounter /ħa/ as an indicative prefix in some Persian Gulf states; and, in South Arabian Arabic (viz. Yemen), /ʕa/ is used in the north around the San'aa region, and /ʃa/ is used in the southwest region of Ta'iz. Loss of /h/ in the third-person masculine enclitic pronoun, when attached to a word ending in a consonant. The form is usually /u/ or /o/ in sedentary dialects, but /ah/ or /ih/ in Bedouin dialects. After a vowel, the bare form /h/ is used, but in many sedentary dialects the /h/ is lost here as well. In Egyptian Arabic, for example, this pronoun is marked in this case only by lengthening of the final vowel and concomitant stress shift onto it, but the "h" reappears when followed by another suffix. maramahūʃ "he didn't throw it"
Agreement (verbal, adjectival) with inanimate plurals is plural, rather than feminine singular or feminine plural, as in CA. Development of a circumfix negative marker on the verb, involving a prefix /ma-/ and a suffix /-ʃ/. In combination with the fusion of the indirect object and the development of new mood markers, this results in morpheme-rich verbal complexes that can approach polysynthetic languages in their complexity. "You (plural) aren't bringing her (them) to us." In Egyptian, Tunisian and Moroccan Arabic, the distinction between active and passive participles has disappeared except in form I and in some Classical borrowings. These dialects tend to use form V and VI active participles as the passive participles of forms II and III. In the imperfect, Maghrebi Arabic has replaced first person singular /ʔ-/ with /n-/, and the first person plural, originally marked by /n-/ alone, is also marked by the /-u/ suffix of the other plural forms. Moroccan Arabic has greatly rearranged the system of verbal derivation, so that the traditional system of forms I through X is not applicable without some stretching. It would be more accurate to describe its verbal system as consisting of two major types, triliteral and quadriliteral, each with a mediopassive variant marked by a prefixal /t-/ or /tt-/. The triliteral type encompasses traditional form I verbs (strong: /ktəb/ "write"; geminate: /ʃəmm/ "smell"; hollow: /biʕ/ "sell", /qul/ "say", /xaf/ "fear"; weak /ʃri/ "buy", /ħbu/ "crawl", /bda/ "begin"; irregular: /kul/-/kla/ "eat", /ddi/ "take away", /ʒi/ "come"). The quadriliteral type encompasses strong [CA form II, quadriliteral form I]: /sˤrˤfəq/ "slap", /hrrəs/ "break", /hrnən/ "speak nasally"; hollow-2 [CA form III, non-CA]: /ʕajən/ "wait", /ɡufəl/ "inflate", /mixəl/ "eat" (slang); hollow-3 [CA form VIII, IX]: /xtˤarˤ/ "choose", /ħmarˤ/ "redden"; weak [CA form II weak, quadriliteral form I weak]: /wrri/ "show", /sˤqsˤi/ "inquire"; hollow-2-weak [CA form III weak, non-CA weak]: /sali/ "end", /ruli/ "roll", /tiri/ "shoot"; irregular: /sˤifətˤ/-/sˤafətˤ/ "send". There are also a certain number of quinquiliteral or longer verbs, of various sorts, e.g. weak: /pidˤali/ "pedal", /blˤani/ "scheme, plan", /fanti/ "dodge, fake"; remnant CA form X: /stəʕməl/ "use", /stahəl/ "deserve"; diminutive: /t-birˤʒəz/ "act bourgeois", /t-biznəs/ "deal in drugs". Note that those types corresponding to CA forms VIII and X are rare and completely unproductive, while some of the non-CA types are productive. At one point, form IX significantly increased in productivity over CA, and there are perhaps 50–100 of these verbs currently, mostly stative but not necessarily referring to colors or bodily defects. However, this type is no longer very productive. Due to the merging of short /a/ and /i/, most of these types show no stem difference between perfect and imperfect, which is probably why the languages has incorporated new types so easily. Egyptian Arabic, probably under the influence of Coptic, puts the demonstrative pronoun after the noun (/al-X da/ "this X" instead of CA /haːðaː l-X/) and leaves interrogative pronouns in situ rather than fronting them, as in other dialects. When it comes to phonetics the Arabic dialects differ in the pronunciation of the short vowels (/a/, /u/ and /i/) and a number of selected consonants, mainly ⟨ق⟩ /q/, ⟨ج⟩ /d͡ʒ/ and the interdental consonants ⟨ث⟩ /θ/, ⟨ذ⟩ /ð/ and ⟨ظ⟩ /ðˤ/, in addition to the dental ⟨ض⟩ /dˤ/. Emphasis spreading is a phenomenon where /a/ is backed to [ɑ] in the vicinity of emphatic consonants. The domain of emphasis spreading is potentially unbounded; in Egyptian Arabic, the entire word is usually affected, although in Levantine Arabic and some other varieties, it is blocked by /i/ or /j/ (and sometimes /ʃ/). It is associated with a concomitant decrease in the amount of pharyngealization of emphatic consonants, so that in some dialects emphasis spreading is the only way to distinguish emphatic consonants from their plain counterparts. It also pharyngealizes consonants between the source consonant and affected vowels, although the effects are much less noticeable than for vowels. Emphasis spreading does not affect the affrication of non-emphatic /t/ in Moroccan Arabic, with the result that these two phonemes are always distinguishable regardless of the nearby presence of other emphatic phonemes. The main dialectal variations in Arabic consonants revolve around the six consonants; ⟨ج⟩, ⟨ق⟩, ⟨ث⟩, ⟨ذ⟩, ⟨ض⟩ and ⟨ظ⟩. [ɡ] in most of the Arabian Peninsula, Northern and Eastern Yemen and parts of Oman, Southern Iraq, some parts of the Levant, Upper Egypt, Sudan, Libya, Mauritania and to lesser extent in some parts (mostly rural) of Tunisia, Algeria, and Morocco but it is also used partially across those countries in some words. [q] in most of Tunisia, Algeria and Morocco, Southern and Western Yemen and parts of Oman, Northern Iraq, parts of the Levant especially Druze dialects. However, most other dialects of Arabic will use this pronunciation in learned words that are borrowed from Standard Arabic into the respective dialect. [ʔ] in most of the Levant and Lower Egypt, as well as some North African towns such as Tlemcen and Fez. other variations include [ɢ] in Sudanese and some forms of Yemeni, [k] In rural Palestinian, [d͡ʒ] in some positions in Iraqi and Gulf Arabic, [ɣ] or [ʁ] in some positions in Sudanese and consonantally in the Yemeni dialect of Yafi', [d͡z] in some positions in Najdi, though this pronunciation is fading in favor of [ɡ]. [d͡ʒ] in most of the Arabian peninsula, Algeria, Iraq, Upper Egypt, Sudan, parts of the Levant and Yemen. [ʒ] in most of the Levant and North Africa. [ɡ] in Lower Egypt, parts of Yemen and Oman. other variations include [j] in the Persian Gulf and southern Iraq and coastal Hadhramaut. [ɡʲ] in some Arabian Bedouin dialects, and parts of Sudan, as the medieval Persian linguist Sibawayh described it. Classical interdental consonants ⟨ث⟩ /θ/ and ⟨ذ⟩ /ð/ become /t, d/ or /s, z/ in some words in Egypt, Sudan, most of the Levant, parts of the Arabian peninsula (urban Hejaz and parts of Yemen). In Morocco, Algeria and other parts of North Africa they are consonantly /t, d/, but remain /θ/ and /ð/ in most of the Arabian Peninsula, Iraq, Tunisia, parts of Yemen, rural Palestinian, Eastern Libyan, and some rural Algerian dialects. In Arabic-speaking towns of Eastern Turkey, (Urfa, Siirt and Mardin) they respectively become /f, v/. Elsewhere, /ʔ/ is simply lost. In CA and Modern Standard Arabic (MSA), /ʔ/ is still pronounced. Modern dialects have smoothed out the morphophonemic variations, typically by losing the associated verbs or moving them into another paradigm (for example, /qaraʔ/ "read" becomes /qara/ or /ʔara/, a third-weak verb). CA /k/ often becomes [t͡ʃ] in the Persian Gulf, Iraq, some Rural Palestinian dialects and in some Bedouin dialects when adjacent to an original /i/, particularly in the second singular feminine enclitic pronoun, where [t͡ʃ] replaces Classical /ik/ or /ki/). In a very few Moroccan varieties, it affricates to /k͡ʃ/. Elsewhere, it remains [k]. CA /r/ is pronounced [ʀ] in a few areas: Mosul, for instance, and the Jewish variety in Algiers. In all of northern Africa, a phonemic distinction has emerged between plain [r] and emphatic [rˤ], thanks to the merging of short vowels. CA /t/ (but not emphatic CA /tˤ/) is affricated to [t͡s] in Moroccan Arabic; this is still distinguishable from the sequence [ts]. CA /ʕ/) is pronounced in Iraqi Arabic and Kuwaiti Arabic with glottal closure: [ʔˤ]. In some varieties /ʕ/ is devoiced to [ħ] before /h/, for some speakers of Cairene Arabic /bitaʕha/ → /bitaħħa/ (or /bitaʕ̞ħa/) "hers". The residue of this rule applies also in the Maltese language, where neither etymological /h/ nor /ʕ/ are pronounced as such, but give [ħ] in this context: tagħha [taħħa] "hers". The nature of "emphasis" differs somewhat from variety to variety. It is usually described as a concomitant pharyngealization, but in most sedentary varieties is actually velarization, or a combination of the two. (The phonetic effects of the two are only minimally different from each other.) Usually there is some associated lip rounding; in addition, the stop consonants /t/ and /d/ are dental and lightly aspirated when non-emphatic, but alveolar and completely unaspirated when emphatic. CA /r/ is also in the process of splitting into emphatic and non-emphatic varieties, with the former causing emphasis spreading, just like other emphatic consonants. Originally, non-emphatic [r] occurred before /i/ or between /i/ and a following consonant, while emphatic [rˤ] occurred mostly near [ɑ]. To a large extent, Western Arabic dialects reflect this, while the situation is rather more complicated in Egyptian Arabic. (The allophonic distribution still exists to a large extent, although not in any predictable fashion; nor is one or the other variety used consistently in different words derived from the same root. Furthermore, although derivational suffixes (in particular, relational /-i/ and /-ijja/) affect a preceding /r/ in the expected fashion, inflectional suffixes do not). Certain other consonants, depending on the dialect, also cause pharyngealization of adjacent sounds, although the effect is typically weaker than full emphasis spreading and usually has no effect on more distant vowels. The velar fricative /x/ and the uvular consonant /q/ often cause partial backing of adjacent /a/ (and of /u/ and /i/ in Moroccan Arabic). For Moroccan Arabic, the effect is sometimes described as half as powerful as an emphatic consonant, as a vowel with uvular consonants on both sides is affected similarly to having an emphatic consonant on one side. The pharyngeal consonants /ħ/ and /ʕ/ cause no emphasis spreading and may have little or no effect on adjacent vowels. In Egyptian Arabic, for example, /a/ adjacent to either sound is a fully front [æ]. In other dialects, /ʕ/ is more likely to have an effect than /ħ/. In some Gulf Arabic dialects, /w/ and/or /l/ causes backing. In some dialects, words such as الله /aɫɫaː/ Allāh has backed [ɑ]'s and in some dialects also velarized /l/. Classical Arabic short vowels /a/, /i/ and /u/ undergo various changes. Original final short vowels are mostly deleted. Many Levantine Arabic dialects merge /i/ and /u/ into a phonemic /ə/ except when directly followed by a single consonant; this sound may appear allophonically as /i/ or /u/ in certain phonetic environments. Maghreb dialects merge /a/ and /i/ into /ə/, which is deleted when unstressed. Tunisian maintains this distinction, but deletes these vowels in non-final open syllables. Moroccan Arabic, under the strong influence of Berber, goes even further. Short /u/ is converted to labialization of an adjacent velar, or is merged with /ə/. This schwa then deletes everywhere except in certain words ending /-CCəC/. The result is that there is no distinction between short and long vowels; borrowings from CA have "long" vowels (now pronounced half-long) uniformly substituted for original short and long vowels. This also results in consonant clusters of great length, which are (more or less) syllabified according to a sonority hierarchy. For some subdialects, in practice, it is very difficult to tell where, if anywhere, there are syllabic peaks in long consonant clusters in a phrase such as /xsˤsˤk tktbi/ "you (fem.) must write". Other dialects, in the North, make a clear distinction; they say /xəssək təktəb/ "you want to write", and not */xəssk ətkətb/. In Moroccan Arabic, short /a/ and /i/ have merged, obscuring the original distribution. In this dialect, the two varieties have completely split into separate phonemes, with one or the other used consistently across all words derived from a particular root except in a few situations. In Moroccan Arabic, the allophonic effect of emphatic consonants is more pronounced than elsewhere. Full /a/ is affected as above, but /i/ and /u/ are also affected, and are to [e] and [o], respectively. In some varieties, such as in Marrakesh, the effects are even more extreme (and complex), where both high-mid and low-mid allophones exist ([e] and [ɛ], [o] and [ɔ]), in addition to front-rounded allophones of original /u/ ([y], [ø], [œ]), all depending on adjacent phonemes. On the other hand, emphasis spreading in Moroccan Arabic is less pronounced than elsewhere; usually it only spreads to the nearest full vowel on either side, although with some additional complications. /i~ɪ/ and /u~ʊ/ in CA completely become /e/ and /o/ respectively in some other particular dialects. In Egyptian Arabic and Levantine Arabic, short /i/ and /u/ are elided in various circumstances in unstressed syllables (typically, in open syllables; for example, in Egyptian Arabic, this occurs only in the middle vowel of a VCVCV sequence, ignoring word boundaries). In Levantine, however, clusters of three consonants are almost never permitted. If such a cluster would occur, it is broken up through the insertion of /ə/ – between the second and third consonants in Egyptian Arabic, and between the first and second in Levantine Arabic. CA long vowels are shortened in some circumstances. Original final long vowels are shortened in all dialects. In Egyptian Arabic and Levantine Arabic, unstressed long vowels are shortened. In most dialects, particularly sedentary ones, CA /a/ and /aː/ have two strongly divergent allophones, depending on the phonetic context. Adjacent to an emphatic consonant and to /q/ (but not usually to other sounds derived from this, such as /ɡ/ or /ʔ/), a back variant [ɑ] occurs; elsewhere, a strongly fronted variant [æ]~[ɛ] is used. Unlike other Arabic varieties, Hejazi Arabic did not develop allophones of the vowels /a/ and /aː/, and both are pronounced as [a] or [ä]. CA diphthongs /aj/ and /aw/ have become [eː] or [e̞ː] and [oː] or [o̞ː] (but merge with original /iː/ and /uː/ in Maghreb dialects, which is probably a secondary development). The diphthongs are maintained in the Maltese language and some urban Tunisian dialects, particularly that of Sfax, while [eː] and [oː] also occur in some other Tunisian dialects, such as Monastir. The placement of the stress accent is extremely variable between varieties; nowhere is it phonemic. Most commonly, it falls on the last syllable containing a long vowel, or a short vowel followed by two consonants; but never farther from the end than the third-to-last syllable. This maintains the presumed stress pattern in CA (although there is some disagreement over whether stress could move farther back than the third-to-last syllable), and is also used in Modern Standard Arabic (MSA). In CA and MSA, stress cannot occur on a final long vowel; however, this does not result in different stress patterns on any words, because CA final long vowels are shortened in all modern dialects, and any current final long vowels are secondary developments from words containing a long vowel followed by a consonant. In Egyptian Arabic, the rule is similar, but stress falls on the second-to-last syllable in words of the form ...VCCVCV, as in /makˈtaba/. In Maghrebi Arabic, stress is final in words of the (original) form CaCaC, after which the first /a/ is elided. Hence جَبَل ǧabal "mountain" becomes [ˈʒbəl]. In Moroccan Arabic, phonetic stress is often not recognizable. Northern varieties are influenced by the Aramaic language and Coptic language. Western varieties are influenced by the Berber languages, Punic or Phoenician and by Romance languages. Jewish varieties are influenced by the Hebrew and Aramaic languages. ^ "Documentation for ISO 639 identifier: ara". ^ Bassiouney, 2009, p. 29. ^ Abdel-Jawad, 1986, p. 58. ^ Bassiouney, 2009, p. 19. ^ Holes, 1983, p. 448. ^ Holes 1995: 39, p. 118. ^ Blanc, 1960, p. 62. ^ Holes, 1995, p. 294. ^ Bassiouney, 2009, p. 26. ^ Bassiouney, 2009, p. 11. ^ Yaghan, M. (2008). "Araby: A Contemporary Style of Arabic Slang". Design Issues 24(2): 39-52. ^ Macdonald, M. C. A. (2000). "Reflections on the linguistic map of pre-Islamic Arabia". Arabian Archaeology and Epigraphy. 11. Retrieved 28 July 2014. ^ Macdonald, M. C. A. (2004). "Ancient North Arabian". In Woodard, Roger D. (ed.). The Cambridge Encyclopedia of the World's Languages. Cambridge University Press. pp. 488–533. ISBN 0-521-56256-2. Abdel-Jawad, H. (1986). 'The emergence of a dialect in Jordanian urban centres.' International Journal of the Sociology of Language 61. Abu-Haidar, F. (1991). Christian Arabic of Baghdad, Weisbaden: Otto Harasowitz. Abu-Melhim, A. R. (1991). 'Code-switching and accommodation in Arabic.' Perspectives on Arabic Linguistics. Badawi, S.A. (1973). Mustawayāt al-'Arabīyah al-mu'āṣirah fī Miṣr: Baḥth fī 'alāqat al-lughah bi-al-ḥaḍārah, Cairo: Dār al-Ma'ārif. Bassiouney, Reem (2006). Functions of code-switching in Egypt: Evidence from monologues, Leiden: Brill. Bassiouney, Reem (2009). Arabic Sociolinguistics, Washington, D.C.: Georgetown University Press. Blanc, D. (1960) 'Style variations in Arabic: A sample of interdialectical conversation.' in C.A. Ferguson (ed.) Contributions to Arabic linguistics, Cambridge, M.A. : Harvard University Press. Dendane, Z. (1994). 'Sociolinguistic variation in an Arabic speech community: Tlemcen.' Cahiers de Dialectologie et de Linguistique Contrastive 4. El-Hassan, S. (1997). 'Educated Spoken Arabic in Egypt and the Levant: A critical review of diglossia and related concepts.' Archivum Linguisticum 8(2). Ferguson, C.A. (1972). 'Diglossia.' Word 15. Holes, C. (1983). 'Bahrain dialects: Sectarian differences exemplified through texts.' Zeitschrift fur arabische Linguistik10. Holes, C. (1995). 'Community, dialect and urbanization in the Arabic-speaking Middle-East.' Bulletin of the School of Oriental and African Studies 58(2). Mitchell, T.F. (1986). 'What is educated spoken Arabic?' International Journal of the Sociology of Language 61. Pereira, C. (2007). 'Urbanization and dialect change: The dialect of Tripoli, Libya.' in C. Miller, E. Al-Wer, D. Caubet and J.C.E. Watson (eds), Arabic in the city: Issues in dialect contact and language variation, London and New York: Routledge. Suleiman, Y. (1994). Arabic sociolinguistics: Issues and perspectives, Richmond: Curzon. Versteegh, K. (2001). The Arabic language, Edinburgh: Edinburgh University Press. George Grigore L'arabe parlé à Mardin. Monographie d'un parler arabe périphérique. Durand, O., (1995), Introduzione ai dialetti arabi, Centro Studi Camito-Semitici, Milan. Durand, O., (2009), Dialettologia araba, Carocci Editore, Rome. Fischer W. & Jastrow O., (1980) Handbuch der Arabischen Dialekte, Harrassowitz, Wiesbaden. Kamusella, Tomasz. 2017. The Arabic Language: A Latin of Modernity? (pp 117-145). Journal of Nationalism, Memory and Language Politics. Vol 11, No 2.